If you're looking for a short homecoming dress that is richly designed as well as figure flattering, this adorable a-line Alyce designer dress deserves your consideration. 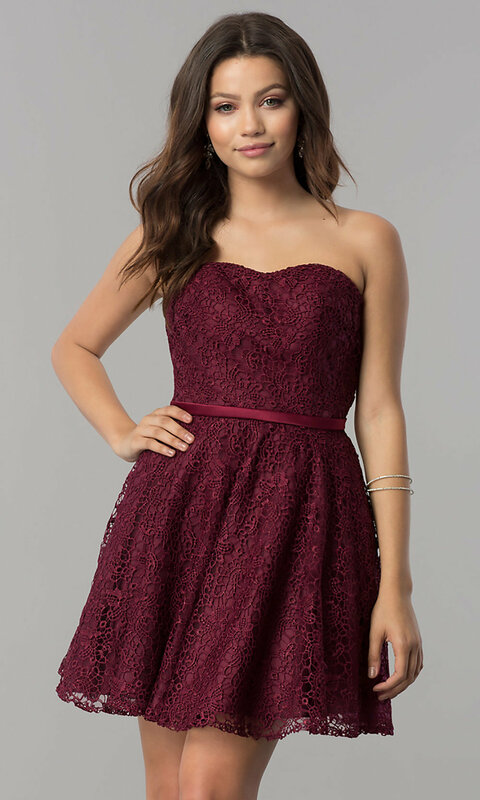 Lovely for rehearsal dinners or graduation parties, this semi-formal dress has a beautiful open-work lace overlay with coordinating lining. 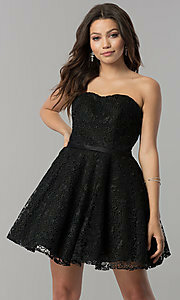 The strapless party dress has a sweetheart neckline and detachable belt that secures below the back cut-out detail. The short lace a-line skirt juts away from the hips creating a youthful look and feel. Under $150, this short homecoming dress from the designers at Alyce is a beautiful and versatile option that won't bust the budget. 27", Hollow to Hem 29"